The Guanaco has been called the South American Horse – and when you observe the animal’s alert stance, upright carriage, and agile movements, it is not hard to imagine them free-ranging in the wilds of Argentina – the southernmost region of South America. It was thought until recently that the Guanaco was ancestral to both the » Llama and » Alpaca – going back many centuries, of course, but recent DNA testing has shown that the Alpaca elvolved from the wild Vicuña. 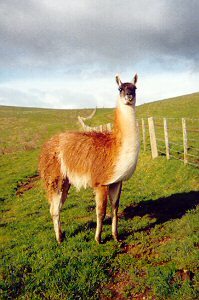 The Guanaco is a finer-built version of the Llama. It has a reddish-brown, or sandy-coloured coat of two layers. The top layer consists of coarse guard hairs, which protect the animal from the cold. The second layer of fibre is very fine, almost like cotton wool, and is used for making fine garments. This fine fibre has tested as low as 15 microns – a micron is a unit of length equal to one thousandth of a millimetre. The face of the Guanaco can be blackish or silvery-grey, with long silvery-grey ears. The legs and the underside of the animal have no fibre, but there are cream fringes of fibre at the edge of the belly, flanks, and chest, with short, dense, soft cream fibre on the underside of the neck. 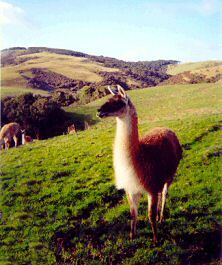 Young Guanacos are called “Chulengos”. Text and photos courtesy Janette Buckingham, Tokonui, Southland.